Browsing Category "SSB INTERVIEW TIPS"
Leadership Qualities - Officer Like Qualities OLQs That a SSB Aspirant are supposed to have? Hey guys I have searched many website for this topic and didn’t found much more about the Officer Like Qualities that a Candidate should have. After a lot of hard work I have concatenated various activities to write a healthy post on All officer like qualities that you can mention in your PIQform. This post will help you in filling up your PIQ form for SSB + It will also help in understanding your strength also. Try picking up the points that suits your personality most. The following are qualities have been generally accepted as the qualities of leader. 1. The extent of knowledge of various subjects of academic pursuit- e.g. Science, History, Economics, Literature, Current events etc. 2. The depth of knowledge – how deeply has the candidate studied a subject of his choice or interest? 3. Application of knowledge- how has the candidate applied his theoretical knowledge to find solution of daily life situations. 4. General knowledge of current affairs, everyday science, burning topics, sports, newspaper headlined etc. 5. Grasp – quickness with which the candidate picks up the core requirement of thee question. 1. Rational, clearheaded, analytical systematic, proceeding step by step and no contradictions. 2. Practical approach- realistic and sensible, use of common sense, alive to facts and existing limitations. 1. Clear aim and objectives- ambition and goal in life e.g., why he wants this job? 2. Planning- working out what is to be done, when and how? 3. Methodical and systematic approach. 4. Mobilization and utilization of resources. 1. Fluency in speech – no stammering, the unwanted gaps while answering the questions. 2. Forceful – deliberates, enthusiastic and arresting. No monotonous or dragging voice. No swallowing of words. 3. No affectations. 4. Convincing ability –speaking with sincerity and conviction. 1. Self confidence. 2. Initiative and enterprise 3. Drive, dash, push, motivation. 4. Promptness in taking decisions, borne out of knowledge and sound judgment. 5. Determination & perseverance 6. Stamina, energy, active temperament and hard working 7. Resourcefulness. 8. Courage, pluck, guts, spirit of adventure, willingness to take risks. 1. Positive thinking, confident and determining approach. 2. Optimistic, hopeful outlook. 3. Sense of right and wrong. Absence of anti-social or negative qualities - e.g., unreasonable fear, persecution complex, jealousy, inclination towards crimes, tendency to tell lies, selfishness, quarrelsome attitudes, irritable nature etc. 1.sense of responsibility. 2. Adaptability 3. Cooperation, readiness to help. 4. Tact, pleasing manner and poise. 5. Preference to group life and activity. 6. Considerations for feelings of others. 7. Friendly. 8. Readiness to sacrifice, selflessness, placing froup before self. 9. Ability to influence others and get things done. 1. Cheerful, pleasant and smiling disposition 2. Liveliness, eager, alert sprightly, inspired, fired with ambition. 3. Enthusiasm, keenness and interest. 4. Appearance, dress and turnout – smart, clean and suited to the occasion. 5. Poise, graceful movements, confident approach, straight walk, looking into the eyes while speaking – not bent headed or looking at one’s toes while speaking. 6. Punctuality. 1. Discipline 2. Loyalty. 3. Integrity and moral values 4. Sincerity. 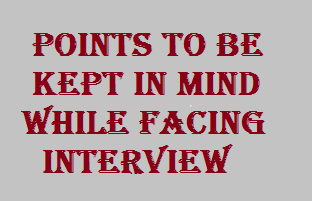 How to success in SSB Interview – Some basics concept to take care of? basic things in mind before going for SSB Interview. These will not clear your SSB Interview for sure but these will lay a positive impact on Interviewer and you will be on safer side always. These includes understanding the Interview Environment, Personal hygiene, Dressing up and normal etiquette/Manners. Unlike the G.T.O tests which is generally held in a informal and relaxed environment, or the psychological tests which is written test, the ‘Interview’, being a one-to-one affair, generally causes a little nervousness, and tension in the candidates mind. The layout of the interview room further components to this stressful condition. It is, therefore, of paramount importance that the candidate must shed his inhibition and overcome his nervousness so that he can collect his thoughts and expression his ideas logically and sympathetically. An interview will normally last 30 to 40 minutes which is sufficient time for the IO to appraise your personality. You should , therefore, aim to make a good forst impression on him and try to sustain that impression till the end of the interview. To achieve this you should take the following steps. 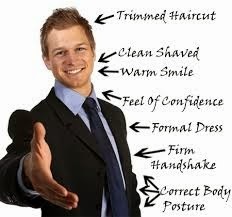 Be clean, neat and tidy when you present yourself for the interview. See that you have good haircut and hair are combed well. Nails of your fingers are cut and clean. Remove sweat, oil, dirt, etc. from your face and forehead. Make sure that no bad odour or smell emanates from you. It is understood that you can’t change your face, but you can certainly do a lot to improve it. Your appearance should show that you an orderly person. Therefore, do take care of you grooming. Shakespeare wrote ‘Apparel proclaimeth a man’ i.e. a man is recognized by the way he dresses. How true! you make the first impression with the way you dress yourself up. If your clothes create and initial unfavorable impression, you will be hard put to neutralize it during the interview. Similarly, with some care for your clothes, you can begin the interview with your right foot forward. It is, therefore very essential that you turn up for the interview, smartly dressed. What type of dress you have for your SSB Interview (According to season)-Dress well as per the season and suited to the occasion. Your clothes should not be gaudy or showy. You must present yourself in a suit in winter. Preferable of dark or sober color. Your shirt must be clean, well ironed and starched. Your shirt cuffs should not be frayed at the ends. Shoes must be well polished. Etiquette, manners and courtesy can help in tilting the interview in your favor. Before entering the room, gently knock it ask for coming inside, beware of push or pull written on door. Just say good evening or good morning according to watch. Don’t sit without permission, reply gently when you asked – how are you? Show your manners by asking the same from IO. Presence of mind should be there be true , don’t try to cheat with them and you will make it. This is main problem that you go for your SSB Interview without Prior Preparation, Preparation gives you success and confidence. So before going for SSB Interview, Don't leave the things on luck, give ample time to its preparation like current events, PI preparation, TAT and PPDT pictures practice, writing of SD at home and so on. Bring confidence in you and it can be done by doing excess practice and preparation, all the students standing there are equal and are there for selection. Have a confidence look yourself into mirror when you are getting prepared for SSB and say yes m looking good and I can do it.Have a confidence of "yes i can do it, and i have it in me"
When you are there for Tasks, before every task they will describe the procedure and how the task will proceed you just need to open your ears and follow your instructor, You generally hear them with closed ears and when you are doing tasks you will either do wrong and will ask others how to do that. If you are not honest with yourself then there is no use of going there, don't hide anything with the IO as they are too smart that's why they are there. Maintain your honesty threw the whole prcess and you will make it definitely. The IO will try to become as much familiar as he can he will offer you tea, a glass of water and will ask u question as if he is your friend. Don't be too much familiar with him as you are giving him a way to catch you, so be careful. He is taught to do so, he is expert in that. Be in limits answer logically and factually. You should know about your surroundings, surroundings means what have you done in 3-4 days where was you lacking like you may lack in courage and so on. Have a close eye on all candidates there and put facts in front of interviewer. A person who is cheerful and enthusiastic is liked by all. Being cheerful shows positivity, whereas if you are dull and non-enthusiastic about things, it’ll reflect negativity. You need to be excited about the tasks, it should reflect from your attitude. Forces is not the place where you can bully people. You need to understand that a good leader leads by example and motivates people instead of bullying them. You need to encourage your group, and not dominate them in order to appear like a real leader. Be in confidence but Not in over-confidence. If you don’t smile you are taking unnecessary tension. People who forget to smile are likely to get nervous and thus mess up the things in which they could have performed well. So you need to take a break and smile. One old person has said "Keep smiling and you will be a officer one day". Mani Kapoor, He is a serving candidate, seeking for ACC commission. 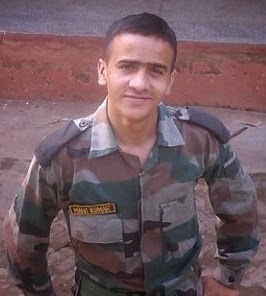 He is now serving in 20 J& K riffle (infantry) and also preparing for his upcoming SSB Interview.